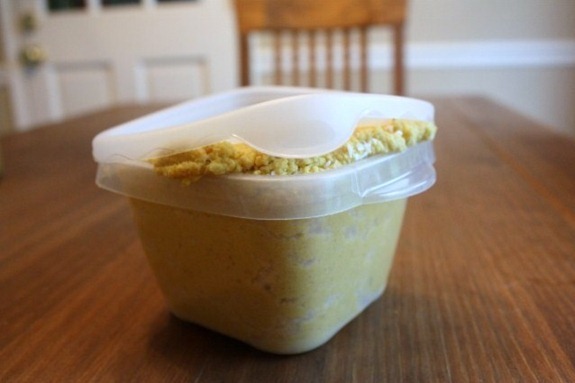 I took a twist on Ashley‘s Curry Honey Hummus and added some coconut! Top with more coconut. It’s quite garlicky, but tastes great! A bit tough to get the lid on! Matt and I vetoed grocery shopping because we felt we had enough of what we needed. After massively cleaning the kitchen again (and packing // blogging my lunch for tomorrow) Matt and I went for a 30 minute walk and talked all things vacations. We might go on an overnight trip for our wedding anniversary coming up next month! And on July 2, the day after I’m finished with my internship, we’re joining my whole family for a week at the beach. I. Cannot. Wait. I’m not sure what’s up with my leg. It feels more like a pulled muscle than an injury. But I can’t really massage it? It’s still behind the knee- almost really the top of my calf muscle? Odd. It bothers me when I do strange moves like vacuuming and I tried to run on our walk and could feel it then too. I wonder if it’s not a running injury but something I might have done at yoga or standing all day at work with locked knees and running just made it worse? Regardless, I’m still laying off of the running (and perhaps I should lay off of housework!) and looking forward to a deep yoga stretch shortly. After our walk I was hungry for lunch and wanted something light before yoga. I had just a little bit of coconut butter left and filled it up with a mango-strawberry smoothie! ~6 almonds (which I don’t think I could taste and forgot about until just now! Is it obvious that I have a granola obsession? 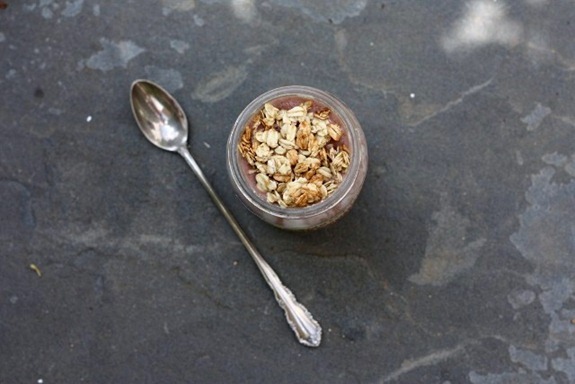 I’m actually trying to use up my granolas – I’ve had some in stock forever! 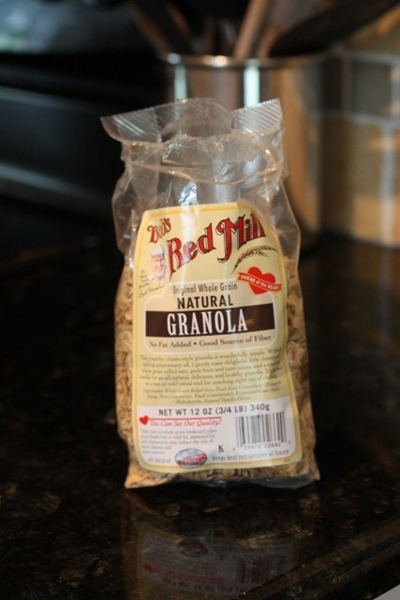 My final sample is a Bob’s Red Mill Natural Granola. It was a great one to end on!! Totally crunchy with large clusters and a wonderful buttery taste. I also nibbled on the mango skins and pit! Might not seem like a big lunch, but energy wise it was probably plenty much! Off to sweat at yoger! Naturally. 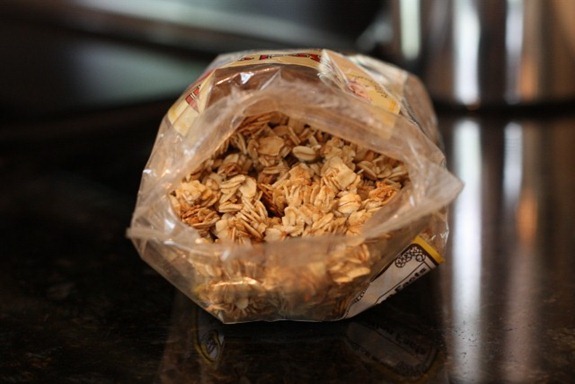 I love granola too – I’m gutted that my all time favourite one has run out now – most.depressing.thing.ever. Nice hummus concoction. The coconut is an addition that I would not expect; do tell how it tastes. That smoothie in a jar is actually quite pretty — reminds me of those mixed/marbleized ‘spreads,’ like that doubtfully healthy ‘Milky Way’ spread they used to sell. Love the hummus recipe! Just bought some unsweetened coconut…gotta try it! Yay for yoga, hopefully the stretch helps a lot. When is your anniversary, mine is next month also, memorial weekend. We are trying to figure out somewhere to go on vacation. I defiantly am ready for a vacation. Darn you, now I want hummus! Whenever I make it, it doesn’t taste fabulous. I am going to try your recipe. Does adding water give the smoothie that watery/washed out taste? I have always been hesitant to add water because I want my smoothie to taste like the berries and not my sink 🙂 haha I usually use soy milk or almond milk, would I notice a difference? thank you!! That was my fear too, but it actually works fine and is good for hydration! Great recipe — going to have to try that out. 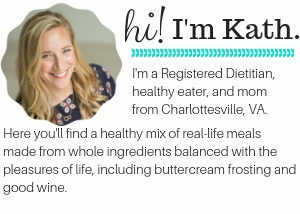 I really want to try coconut butter, barney butter, chia seeds, and a ton of other products because to you, Kath. =] I have a question about the Vita-Mix. Does it crush ice well? I craved a homemade frappichino a couple days ago and my blender just wouldn’t cut it. Thanks for your opinion! Yes they can, beautifully. Just buy some earplugs to protect your hearing! Apparently one of the promo videos for the Vitamix shows it crushing avocado pits- thats what sold it for me! That hummus concoction sounds awesome – I love spicy hummus! I had the same weird pain behind my knee earlier in the week, and it went away in a few days. I foam rolled my hamstring, calf and IT band on that side, and I stretched my calves like crazy (drop your heel on a step, do the wall pushup, etc.). I also tried using a tennis ball to get really deep into the calf muscle, because it felt like there was a knot right at the lower leg/knee junction. Good luck! I had hummus for dinner just last night in an amazing wrap. I have bought all of the ingredients to make my own, but just haven’t done it. Thanks for the inspiration! Although I’m not your doctor I would think it is a running injury just because I have the same thing going on right now after a 10K a few weeks back. Now I have to go to PT for it. The doctor recommended to continue to ice, stretch and foam roll. You might want to get it checked out. Love the smoothie in a jar! and that hummus sounds delicious. 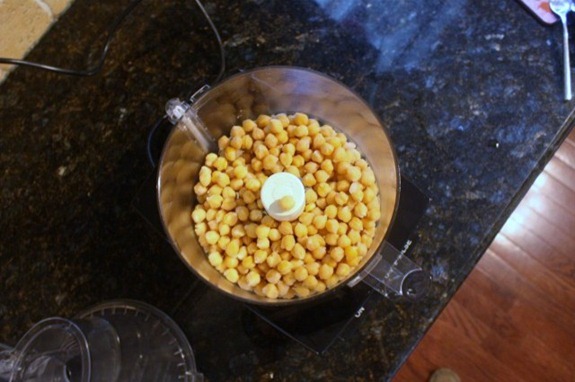 Hummus is just too easy to not make it yourself! Oooh, coconut hummus = brilliant idea. Hope your leg feels better soon! Have a great time at yoga! Ashley has the best recipes ever. That hummus looks incredible! WOW! that looks amazing! Now I need a big food processor, so I can make a huge batch! Oh on the smoothie totally going to go make that NOW! 1. I just made hummus and yours looks 10,000x’s yummier. I’ll have to devour my batch and make yours next. 2. 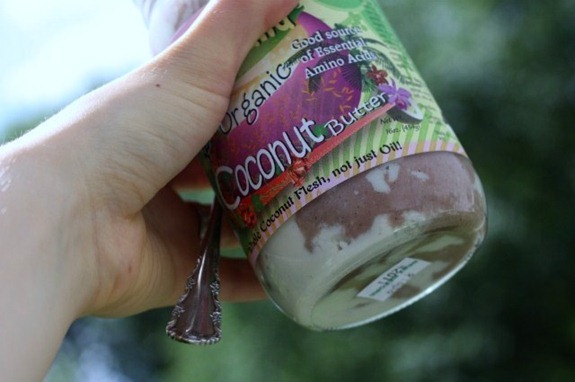 Is coconut butter the same as coconut oil? 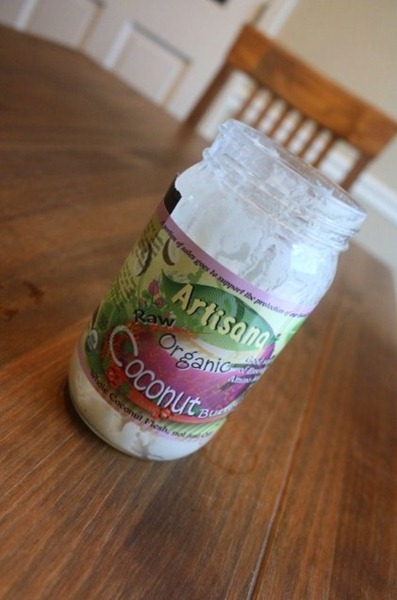 I went hunting for some butter and found coconut oil, which looks like what you’re using…Is yours sweetened or completely natural? Coco butter + oil are different. 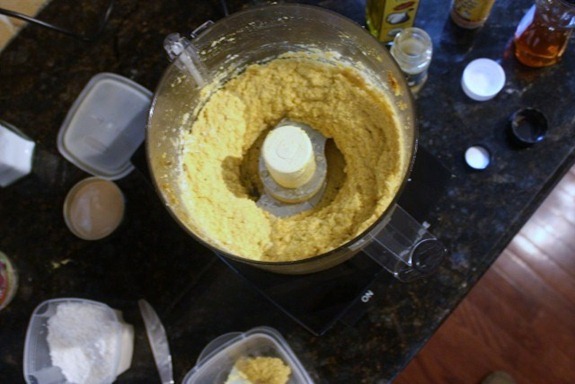 The oil is extracted and the butter is the meat, pulverized. It’s completely natural. hey Kath! sorry i only pop in once in a while to comment, your hummus and siaj look marvelous! 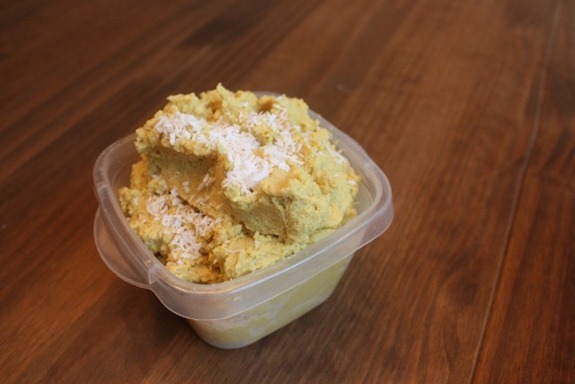 I love using coconut butter in my hummus recipes! 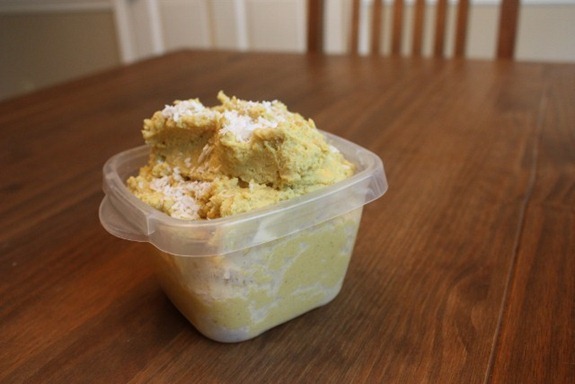 I’ve made a similar version to yours with mango, curry, and coconut butter. Mmm. That hummus seems oh so yummy. 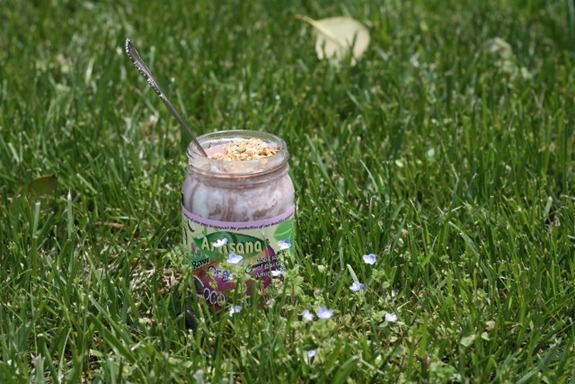 i love the idea of coconut and hummus…all about the sweet and savory. hope your leg does better. 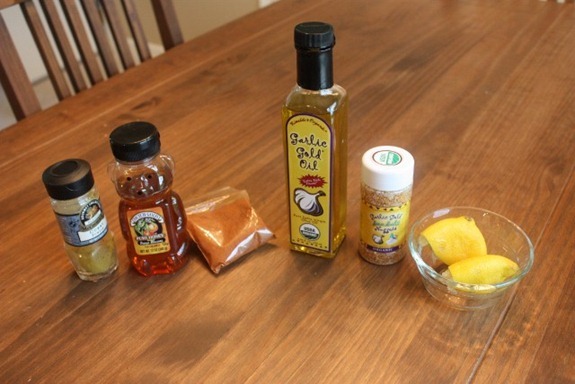 you should throw some extra curry powder and honey in for good measure too…HOLY YUM! The smoothie looks fabulous! Have fun at yoga! 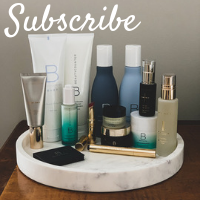 Can someone please help me figure out how to put an already made blog template on to a wordpress blog? I am frustrated to tears! Kath, I am loving the looks of that hummus. I have a bag of crackers just aching to be dipped in there. That looks like the perfect lunch for me! What a fun twist on the hummus…do you like it better with the coconut or just the plain curry honey? 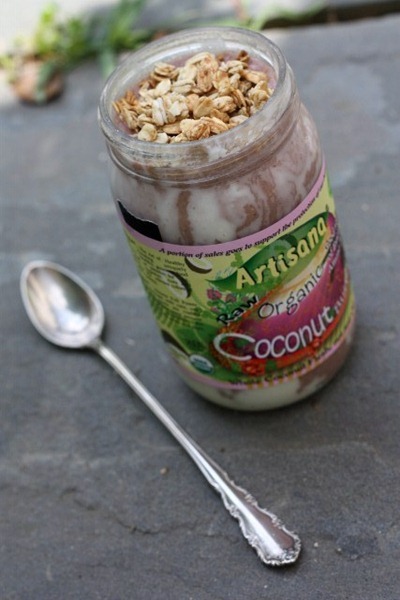 Love the swirl action of coconut butter w/your smoothie…mmmm fabulous idea! My next goal is to make coconut butter 🙂 Have a great yoga + night! I honestly can’t taste the coconut much. And I think I added too much garlic this time! That sounds sooo good!!! I need to get some coconut butter asap! Sorry to hear about your injury issue 🙁 Boo. Your outside pics are so fun! 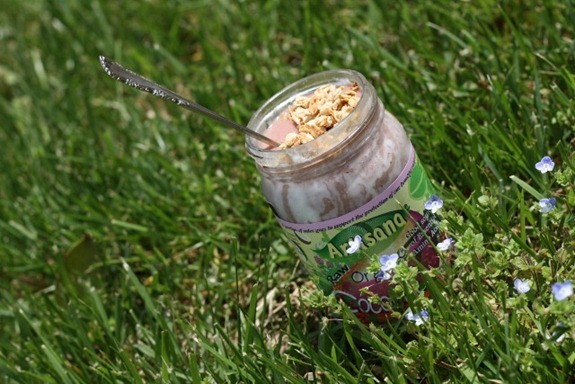 I’m going to look for the BRM granola – mmm! I haven’t had much luck here in Charlotte either, so I just buy them online. I am not positive, but it sounds like it could be your popliteus muscle that is bothering you? It is a really small muscle behind your knee, and it runs pretty deep so it is harder to get to if you are using ice or trying to massage it. It helps rotate the knee, so it could bother you doing simple things like vacuuming. Might be something to look into. That sounds like the closest guess yet… I will investigate! I’m sorry your knee isn’t feeling great. Mine isn’t either and it’s partly because I keep banging my knee on my bike! Did you possibly bruise your knee? Well, it’s better than a crack cocaine addiction. You’ve got that going for you! 😛 I wish we had these kind of granolas in Australia, but there’ so much we’re lagging behind in in the super-yummy-healthy-snacks stakes! 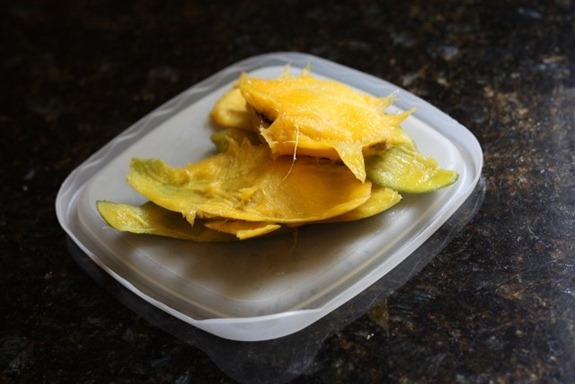 OMG, I cut up a mango and nibbled on the pitt and skins today too!!! I love talking all things vacation! I’m a bit behind, but I made Curry Honey Hummus on Sunday too. I roasted some eggplants (Japanese, of course) and a yellow pepper, and made sandwiches for the week. Yum!